What will you make your family, sweetie, friends or co-workers for Valentine’s Day? 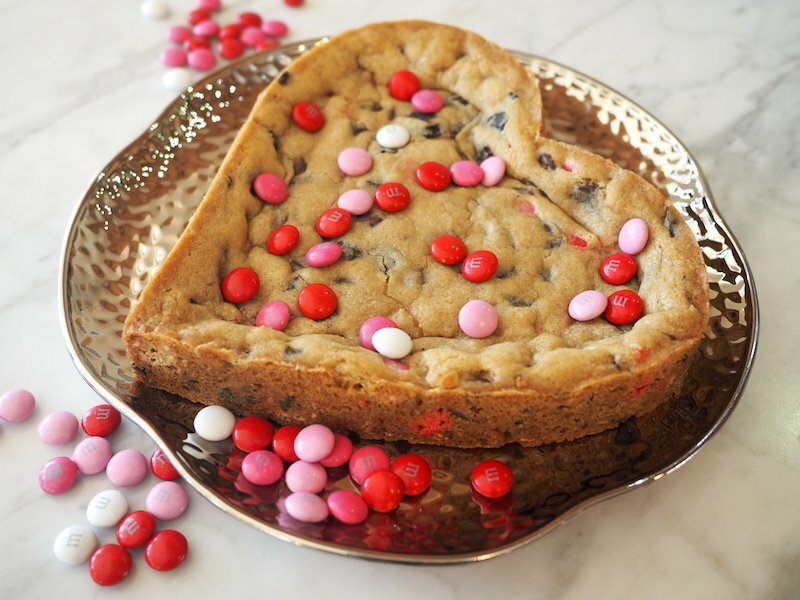 How about this simple Giant Chocolate Chip Cookie Heart? Chewy, dense, crisp buttery edges, and loaded with chocolate! What do you usually do for Valentine’s day? With restaurants being so busy, for most years it typically lands on a busy school night, I usually try and make a fun dinner for our family at home, usually inhaled eaten in 20 minutes because we have to get across town for swimming or a basketball game! Oh sure in the early years, my hubby would take me out to a fancy restaurant, buy me roses and I’d get all dressed up, but I’m really not a make-a-big-fuss kind of girl. Now I try setting a pretty table using the good dishes and crystal, sometimes I’ll even set things up on the coffee table in front of a fire, which is how we did it last year (we did talk, I promise). Changing things up is fun, even for teenage boys! 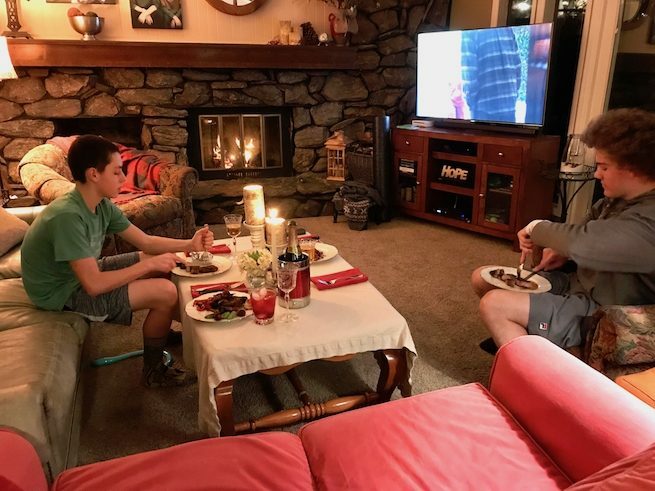 I really do prefer to stay home; family dinners are getting harder to come by in these teen years, and I cherish those times together. So I chill some Martinelli’s for the boys and I might make a special cocktail for Brad and me, doesn’t really matter what dinner is, it’s dessert that counts! This is one of our favorites; the density, chewiness, crisp edges of this giant chocolate chip cookie is so scrumptious. So how do you make this beauty? Pretty simple, actually! 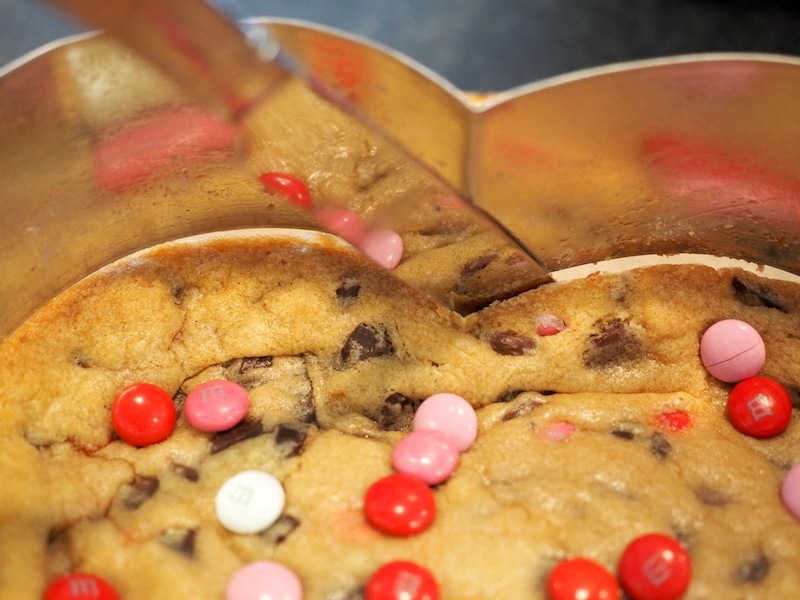 Start with my basic Chewy Chocolate Chip Cookie dough and simply replace the mini-chocolate chips with 1 (heaping) cup of Valentine’s M & M’s in addition to the regular chocolate chips and chunks. Stir them carefully into the dough, there is not such thing as to chocolatey, is there?? 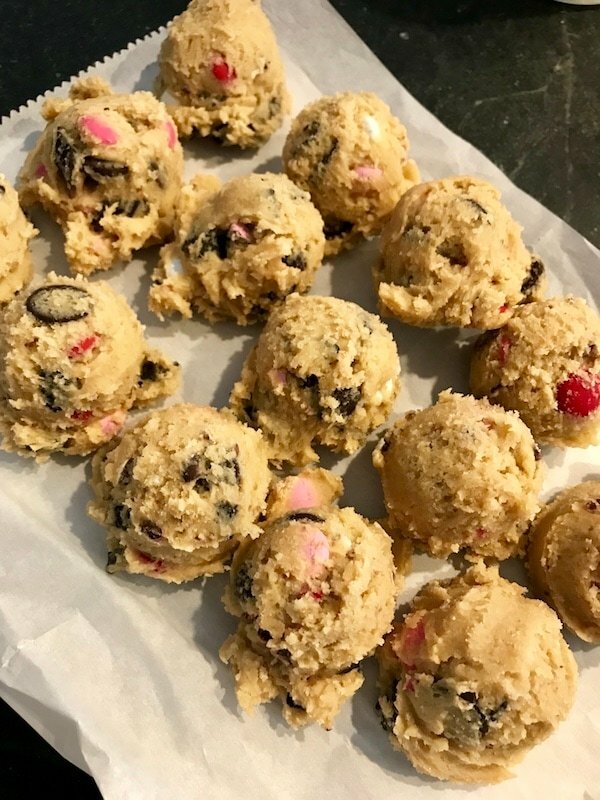 NOTE | You can see the step by step for the cookie dough in the link above, but the complete recipe for the cookie dough is at the end of this post. Reserve some M & M’s for placing on top after baking. If you happen to have a heart-shaped pan, great! Mine is actually a heart form from a spring-form pan. 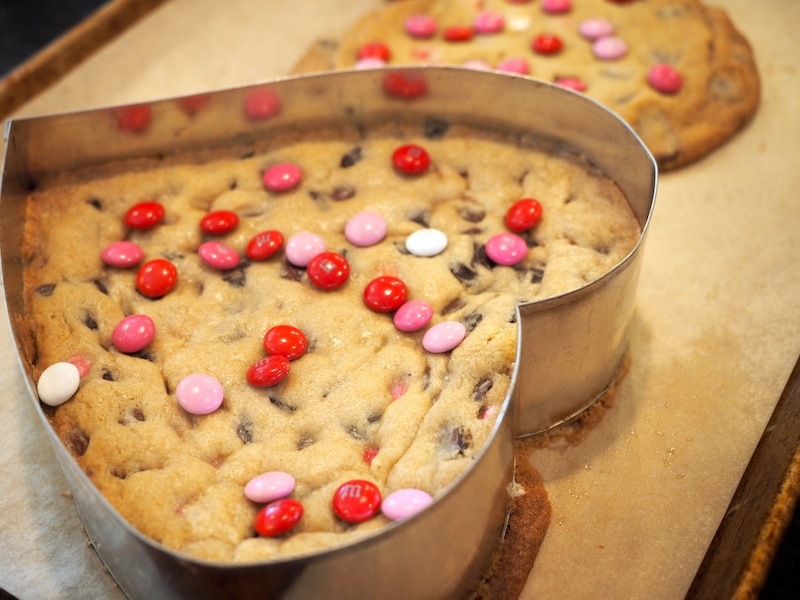 OR you can use an 8 or 9″ round cake pan, nothing wrong with a giant round cookie! 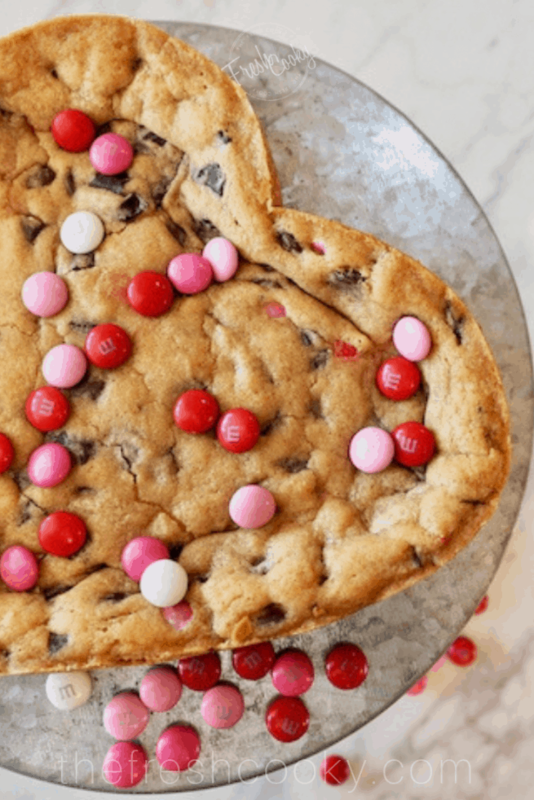 If you must have it heart-shaped cookie, then check out these options. 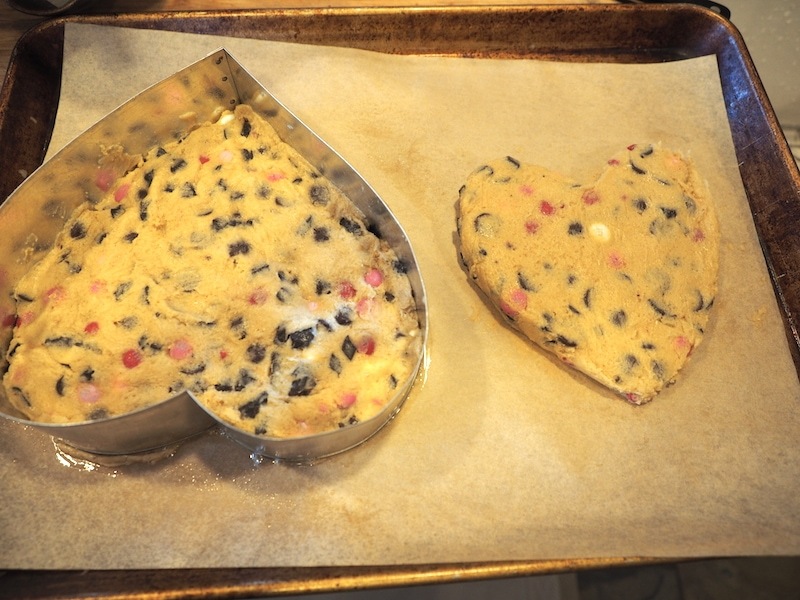 10″ heart shaped pan 6″ heart shaped pan (make 2 or three! ), these tart pans are darling, or this heart shaped variable size set. Be sure to liberally grease your pan in preparation, using non-stick cooking spray or spray oil. Press the cookie dough into the pan, about 3/4 inch thick, adding or removing dough as needed. 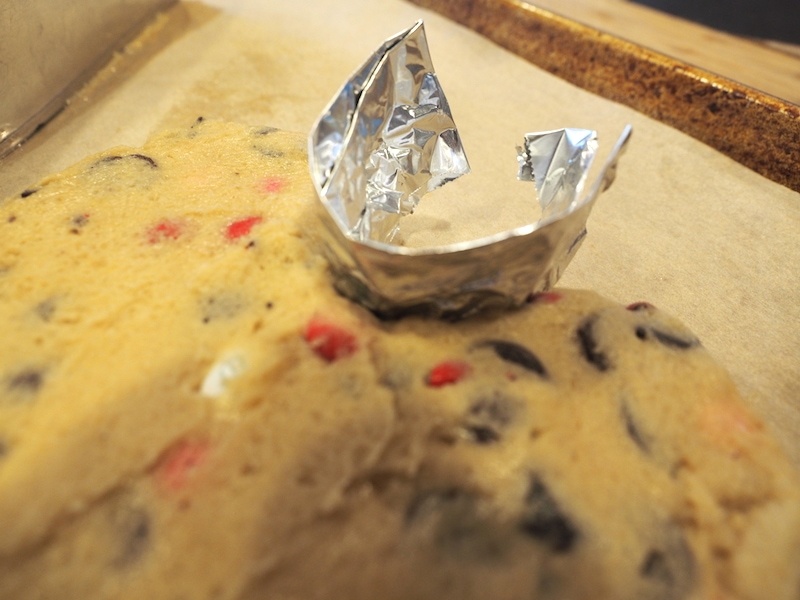 TIP | Using a piece of plastic wrap or parchment paper to evenly press the cookie dough throughout the form or pan. You can attempt to make a free-form heart, I made an extra smaller heart, just by pressing it into a heart shape. TIP | If using a form and not a pan, or free-forming your hearts, be sure to place on a cookie sheet lined with parchment paper, I love these natural, pre-cut sheets. 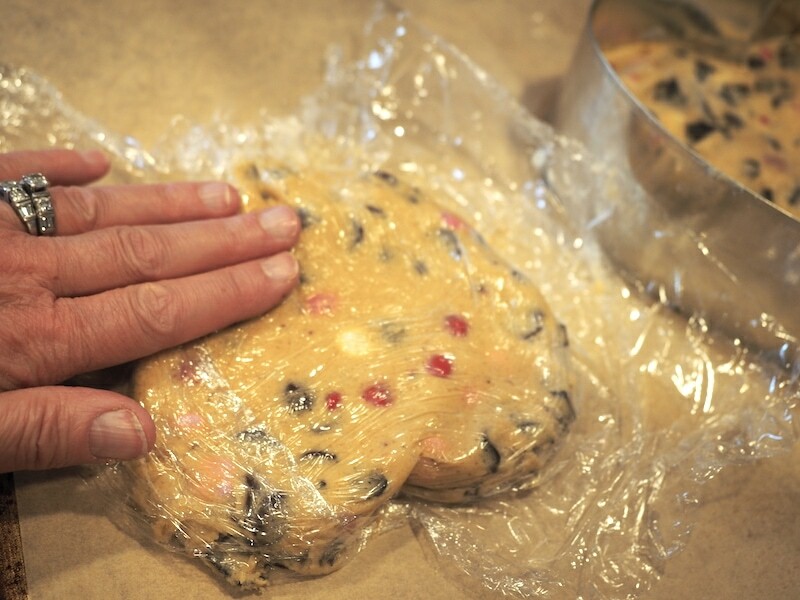 Next, freeze the dough for 30 minutes until firm, don’t skip this step! In order to keep the dip in the top of the heart (it probably has a technical name) I used a little folded foil, sprayed with non-stick oil and tucked it in to help it keep from spreading. About 15-20 minutes into chilling, preheat your oven to 350°. Place cookie sheet, or cake pan into oven and bake for 15-20 minutes, watching closely towards the end. Depending on how thick you made the cookie, it will cook quicker or slower. Remove from oven when edges are lightly browned and crispy, center will still be pretty soft and gooey. Allow to cool completely on cookie sheet, on cooling rack. 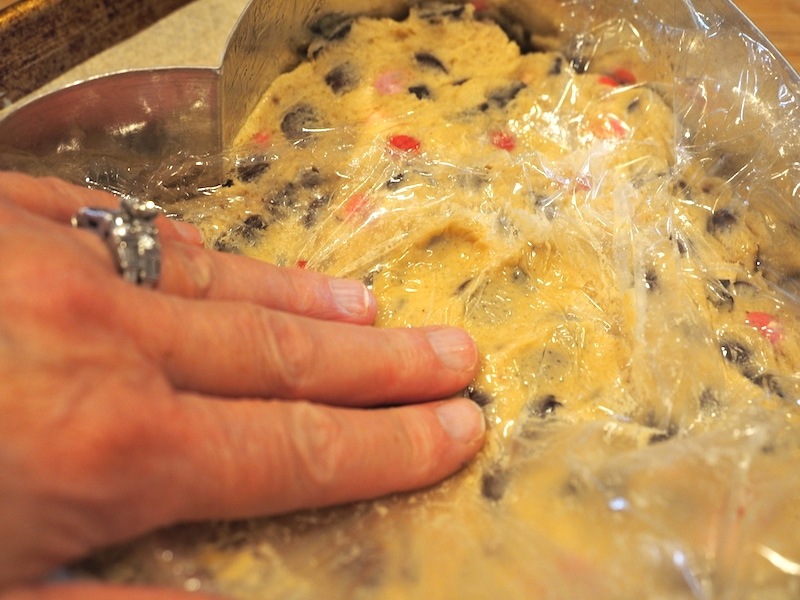 TIP | Using another handful or two of M & M’s, gently sprinkle all over the giant cookie while cookie is still hot and if desired press into cookie. Once cooled, using a table knife, gently insert between sides of cookie and pan and release from mold or pan. If removing from a pan, allow to cool for 15-25 minutes, use a knife to separate the edges from the pan, carefully turn over onto cooling rack laid on top of pan. Invert and allow to cool completely. If you prefer not to have cooling rack marks, using the same method, invert back using another cooling rack. Be sure that you greased your pan extremely well before baking! TIP | Even as mine cooled, the center was still quite gooey, I wanted to move it to a serving plate, so I placed the cookie sheet back in the freezer for 15 minutes just to harden the center. Then using a large spatula it transferred quite easily to the serving plate. If baking free-form hearts or baking smaller hearts, they will need less baking time, watch them closely. Mine did spread even after freezing, but it didn’t stop my family from tearing into the cookie! Serve on a pretty plate or pedestal, slice into wedges using a knife or pizza cutter. Serve cold or warm with a scoop of your favorite ice cream and chewy hot fudge sauce or bourbon caramel sauce for an extra decadent dessert. Which is kind of the point for Valentine’s day right?? TIP | To reheat the cookie, place on a cookie sheet into a 250° oven for about 5-10 minutes until warm through. This recipe makes two large cookies, or one large cookie and about 16 regular size cookies! 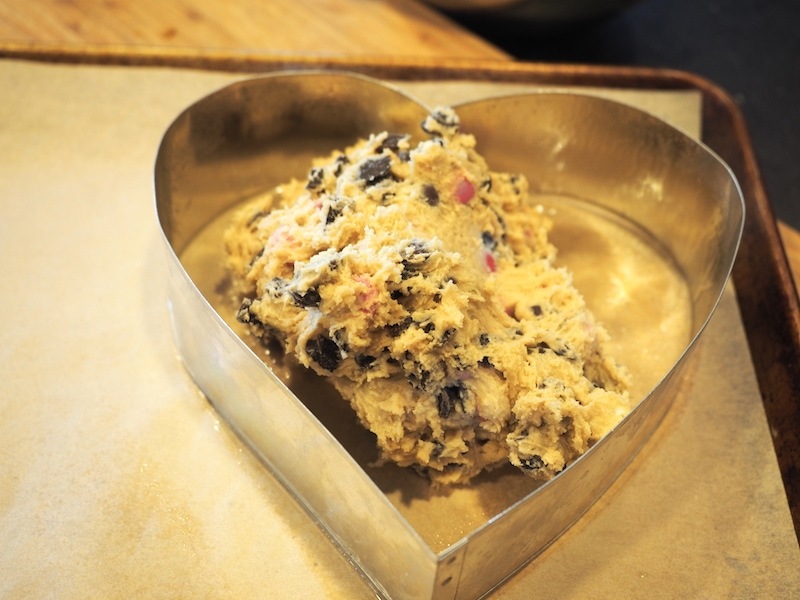 I scooped my extra dough using a medium cookie scoop. Freeze the dough balls on a small cookie sheet or plate until firm, then transfer to an airtight container or freezer baggie. When ready to bake, allow to come to room temperature while you are preheating your oven, about 10-15 minutes and bake at 375° for 8-10 minutes. That’s it, super simple! Here’s the handy printable. This is the perfect dessert for this Valentine’s day! A giant, chewy chocolate chip cookie, with crisp-buttery edges and a soft chewy center. Cream softened butter in mixer, 1 minute. Add both white and brown sugar and cream well, scraping down sides often for 2 minutes. Mix in eggs, one at a time, cream 1 minute each and scrape down sides in between. Pour in vanilla and mix well. While creaming butter and sugar mixture; in a medium bowl, mix together flour, baking soda and salt gently with a whisk. With mixer on low or stir, slowly pour in ½ cup of flour mixture at a time and gently mix, add water in between flour mixing, don’t over mix. Once mixed well, scrape sides of bowl and pour in chocolate chips and chunks, mix on low, until combined. 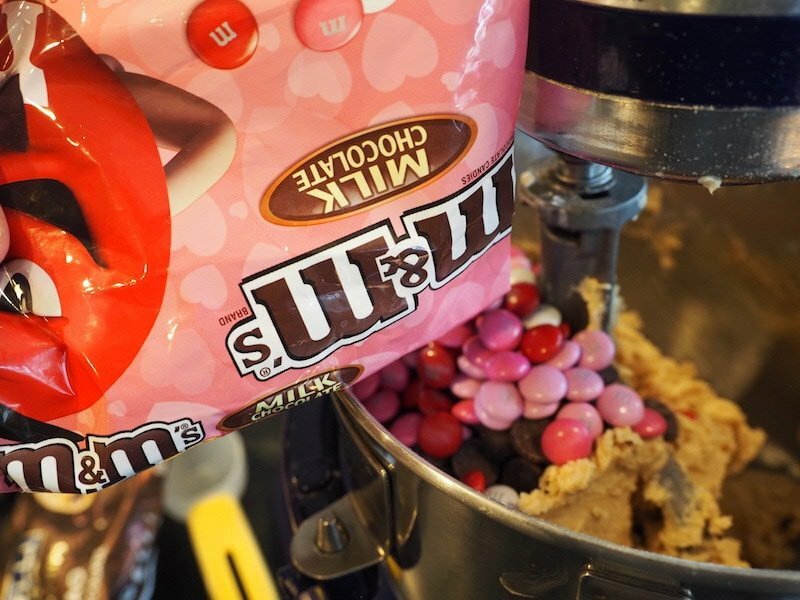 By hand, stir in the M & M’s into the batter. 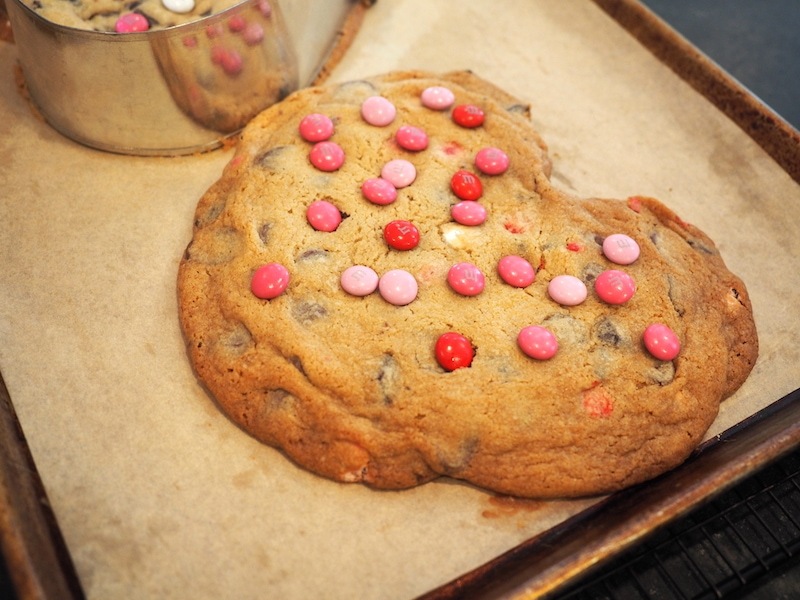 Generously grease your 9-10″ heart shaped form or pan and place on cookie sheet lined with parchment paper. May use smaller pans, just reduce baking time. Measure out enough batter to fill the shaped pan, about 3/4″ thick, using a sheet of wax paper or plastic wrap, make sure it is spread evenly and to the edges. About 15 minutes into freezing, preheat oven to 350 degrees. Remove heart shapes from freezer and place in preheated oven. Bake 15-25 minutes (watch closely, depending on the size of your pan and the amount of dough you placed in the pan will determine how long it will take to bake.) It should be golden at the edges, starting to pull away with the center still looking slightly underdone. Remove from oven when edges are slightly browned and center is set, but will probably still be pretty gooey. If desired, sprinkle another handful of M & M’s over the top of the hot cookie. Allow to cool on a cooling rack for 15-30 minutes if using a pan or fully on cookie sheet if using a form. When ready to release from form or pan, take a table knife and gently run around the edges of the cookie, separating from the pan. Lift off form and allow to continue to cool completely. If using a pan, place a cooling rack over the top of the pan and carefully invert onto cooling rack. Do the same thing again with another cooling rack if you prefer not to have rack marks on the cookie. If needed to move to a serving plate, freeze for 15 minutes, then use a large spatula to transfer to plate. Scoop into balls using a medium sized scoop onto a parchment lined cookie sheet, 2 inches apart. Place in fridge (or freeze until ready to bake) 10 minutes prior to baking, bake at 375 degrees 8-10 minutes until just set and slightly golden. Cool on pan 2-3 minutes and then remove to cooling rack to cool completely. Enjoy warm or room temp. If not enjoying all the cookies at once, freeze dough balls until firm, then place in freezer ziplock bag until ready to use. Once ready to bake, take out of freezer and place 2 inches apart on parchment lined baking sheet. Let soften while the oven preheats. Bake as directed above. Always fresh cookies! 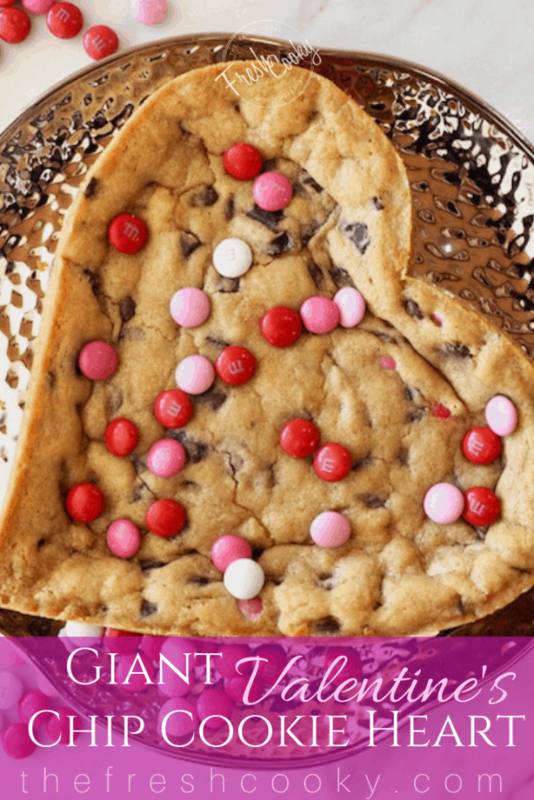 © 2018 | This recipe for Giant Chocolate Chip Cookie Heart was featured first on The Fresh Cooky.